Donated in March 2009, the Arsho Baghsarian shoe design collection comprises approximately 26 cubic feet (14 cubic feet for the sketches and 12 cubic feet for the sample shoes and embellishments). The collection contains 561 shoe prototypes (210 total pairs and 141 total single shoes), 9 original boxes, 4 accessories (2 pairs of Shin-Shams) and 4752 design sketches, some handbags but mostly shoes shown in profile. 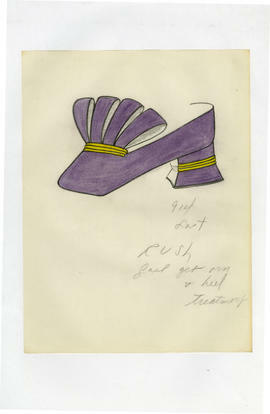 Many, especially during the later part of her career are sketch copies since the originals remain at the factory. The original sketches are done in pencil, ink and gouache and photocopied. Additionally, there are numerous fabric and leather swatches, samples of ornament and color charts, roughly 102 pattern pieces, 224 advertisements primarily from The New York Times and Footwear News, 47 photographs primarily from the Margaret Jerrold retrospective exhibition held at Lord and Taylor in 1982, assorted press clippings, and 43 spiral-bound shoe forecasts from the 1950’s and 1960’s from the Mademoiselle Shoe Company. This is undoubtedly an important collection due in part to Baghsarian’s artistry and sculptural sensibility. She was able to utilize and craft a wide variety of materials to produce throughout the world during a career that spanned more than forty years from 1963 through 2008. The range of materials makes the collection an important tool for conservation, while the collection of design sketches, actual shoe prototypes and marketing, sometimes in publications that have greatly transformed or no longer exist, gives students a sense of art marketing and fashion history.